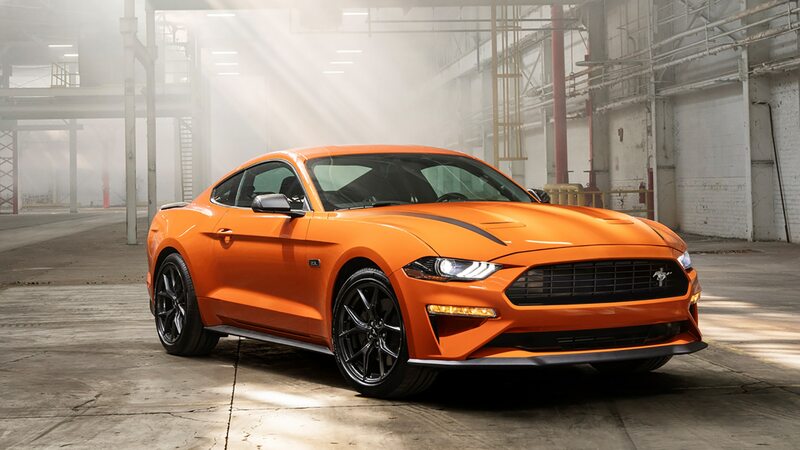 Capacity utilization at Ford’s Valencia, Spain, engine factory gets a boost from the ’20 Mustang, as it will adopt the Focus RS engine for a new affordable performance version coming this fall. The RS’s 2.3-liter EcoBoost inline-four has been turned 90 degrees for the longitudinal, rear-drive application, but don’t expect it to be called RS—that’s already claimed in the segment by the Chevrolet Camaro. 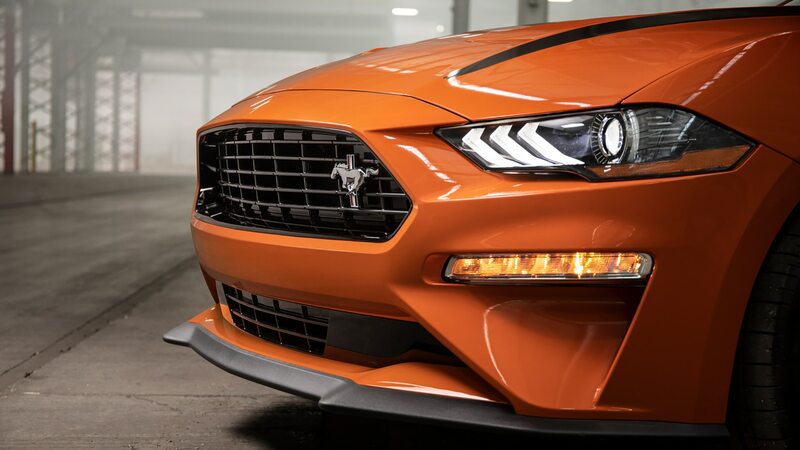 Instead, the car will go by the more ungainly 2020 Ford Mustang 2.3-liter High-Performance Package. Key to the transformation is the adoption of the Focus RS’s high-performance cylinder head, which allows for “a lot more boost” compared with the standard 310-hp, 350-lb-ft 2.3-liter Mustang EcoBoost four, says Carl Widmann, the model’s chief engineer. Widmann’s engineering team fitted a 63-mm twin-scroll turbo compressor, which is five percent larger than was used in the Focus RS, and a larger radiator to the new Mustang. Engineers then calibrated the 2.3 to couple with both of the pony car’s transmission choices, a 10-speed automatic and six-speed Getrag manual. In the Mustang, the result is 330 horsepower, which is impressive at 143 horses per liter but still 20 ponies shy of the Focus RS. 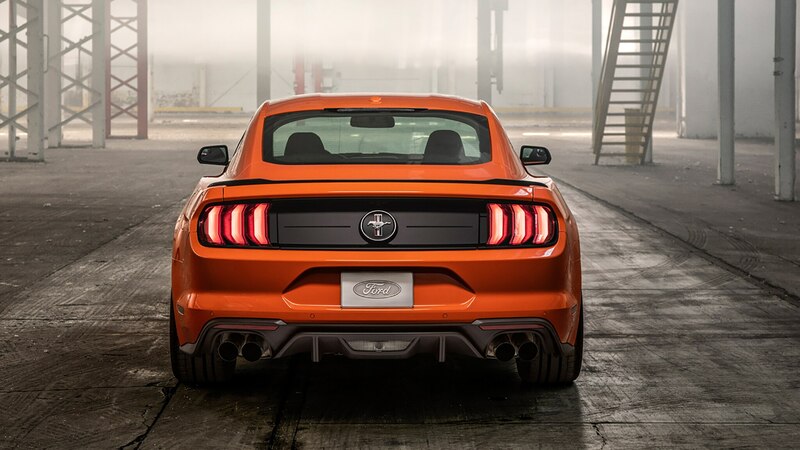 Torque equals the standard 2.3-liter Mustang at 350 lb-ft, though on a broader curve, with 90 percent of peak torque available between 2,500 and 5,300 rpm. 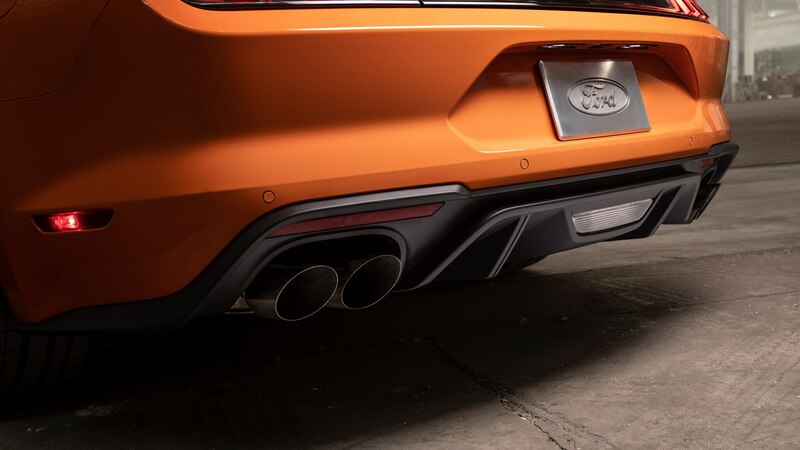 Ford claims a zero-to-60-mph time in the mid-four-second range on premium fuel, and a top speed of 155 mph, 10 mph higher than the ’19 Mustang EcoBoost Performance Package. It also comes with a specifically tuned low-pressure exhaust. 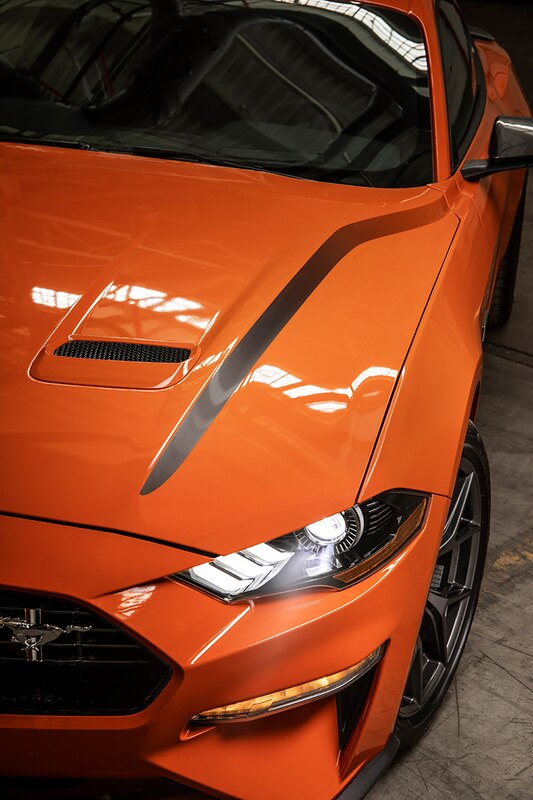 The 2.3-liter High Performance Package will be available on the ’20 Mustang coupe and convertible and is visually set off by its black “whisker” hood decals and a front splitter, grille, and rear spoiler from the GT Performance package. The brakes feature 13.9-inch rotors and four-piston fixed calipers in front and 13.0-inch rotors and single-piston calipers at the rear. A front tower-to-tower strut brace is said to deliver “very precise” steering, and the car also has specific damper and spring tuning, 255/40-19 Pirelli performance rubber, and a 3.55:1 limited-slip rear axle. 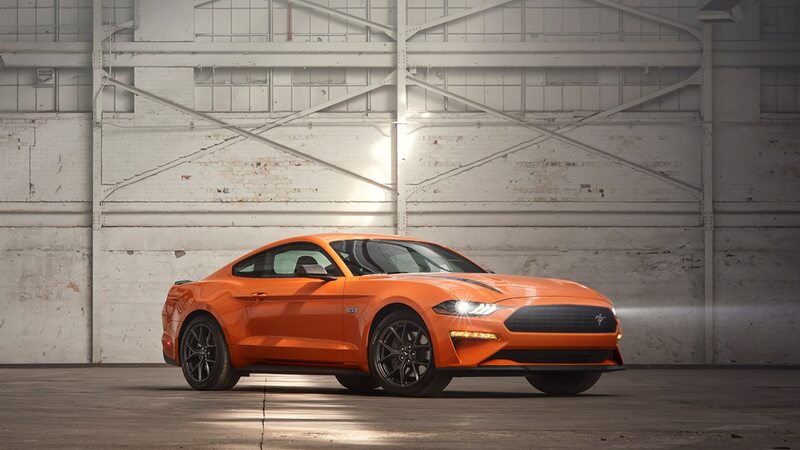 The power steering, anti-lock brakes, and traction control are all uniquely calibrated for this version of the car, and the automatic transmission’s is programmed to upshift points about 500 rpm higher than in the regular EcoBoost Mustang. An optional handling package is available only on coupe versions of the new model, adding magnetorheological dampers, 9.5-inch-wide wheels (they’re normally 9.0 inches wide), a 24-mm solid rear anti-roll bar (up from 21.7 mm), 265/40ZR-19 Pirelli P Zero Corsa 4 tires, stiffer springs, and a Torsen limited-slip diff. Along with the rest of the model line, the new variant gets updated Sync 3 infotainment, plus four new paint colors: Twister Orange, Grabber Lime, Iconic Silver, and Red Hot. While Ford hasn’t announced pricing yet, the higher-performance 2.3-liter model will be priced between a base car with the Performance package and a Mustang GT, so expect an MSRP in the mid-$30,000 range. Beyond coverage from stories like this one and the actual sales of the new car, perhaps the biggest benefit is to the aforementioned factory in Spain. The engine-assembly line there has been closed since production of the Focus RS ended about eight months ago. Smarter utilization of capacity such as this might be a new trend—witness Acura’s plan to build special-edition TLXes and MDXes in the NSX’s Performance Manufacturing Center.